Welcome to StarLamps.net! 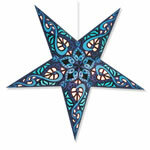 We pride ourselves in carrying the largest selection of paper star lamps in the USA. Browse our site and you will find a wide selection of colors and designs that are perfect for your living, bedroom, dorm, baby room or for your next party. In addition to our wide selection, we strive for excellence in customer service. We guarantee satisfaction with every order. We guarantee your satisfaction with a "no-questions-asked" return policy. If you receive anything that you are not completely satisfied with, simply return it to us and we will refund your payment promptly (less shipping charges). Your order is shipped within 2 business days of receipt, and is often shipped the same day. We offer affordable shipping via the US Postal Service Priority Mail which is delivered in 3-5 business days for most US locations. Need your order right away? We also offer expedited shipping by Fedex at very reasonable rates. If your order is over $50, it ships for free by Priority Mail! We accept all major credit cards via PayPal, so you know your information is safe. Our paper star lanterns are stunning when lit, and we have a nice selection of round paper lanterns and round nylon lanterns, too. If you have any questions, or prefer to place your order over the telephone, we are here to help you toll-free at 888-241-7807. You can also email us at stars@starlamps.net.